Includes everything you need for total hip replacement surgery recovery. The reacher grabber and round bath sponge help you reach those faraway places without needing to stretch or strain, while the shoehorn, sock aid, and dressing stick make getting dressed without bending or twisting easier than ever. 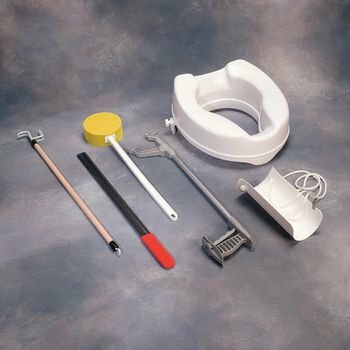 Secure the Savanah Raised Toilet Seat to any standard toilet to increase the height of the seat and make moving to and from the seat more comfortable. Use the hip kit after any surgery or injury that limits your range of motion or mobility.